Samar was once one island province comprising one political unit, the whole island being the third largest in the archipelago. The Island of Samar is bounded on the north by San Bernardino Strait, on the west by the Samar Sea and San Juanico Strait, on the south by Leyte Gulf, and on the east by the Pacific Ocean. Today the island comprises three administrative provinces: Eastern, Western and Northern Samar. It was in Homonhon, an island off the Samar coast, where Magellan first landed in 1521. In the year 1596, the Catholic faith was brought to the island of Samar by the Spanish Jesuit missionaries. From the mission center in Palapag in northern Samar, the missionaries brought the faith to the people of Laoang, Catubig, Pambujan, Catarman, and Bobon. The missionaries from Catbalogan established missiones in Gandara and Paranas, while the missionaries from the island of Capul established mission stations in Calbayog. In 1768 the Jesuits were expelled from the Philippines and the Spanish Franciscan missionaries took over the first parishes in Samar: Catbalogan, Gandara, Paranas, Palapag, Catubig, Catarman and Capul. From these settlements the Catholic faith spread to the entire island. Leyte and Samar were once considered one province by the Spanish government placed under the jurisdiction of Cebu. In 1768 it was divided into separate provinces, with Tacloban as the capital of Leyte and Catbalogan the capital of Samar. 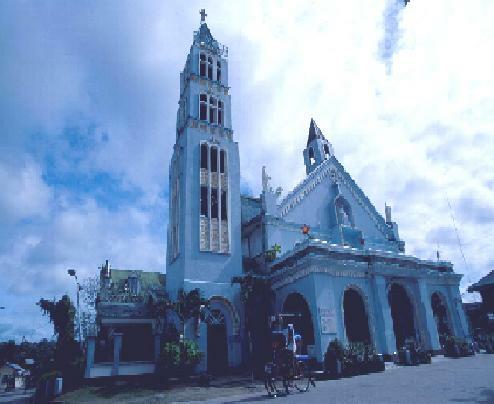 On April 10, 1910, Pope Pius X separated the island provinces of Samar and Leyte form the Diocese of Cebu, and erected the Diocese of Calbayog comprising both island provinces. In 1914 the Franciscans turned over the administration of the parishes of Samar to the secular clergy. On November 28, 1937, Pope Pius XI separated Leyte from the Calbayog diocese by creating the Diocese of Palo, in Leyte. On October 22, 1960 Pope John XXIII decreed the division of Samar by creating the Diocese of Borongan, also in Samar. And again on March 11, 1975, Pope Paul VI decreed the creation of the Diocese of Catarman, also in Samar. Thus the whole island of Samar now has three dioceses: Calbayog in Western Samar, Borongan in Eastern Samar, and Catarman in Northern Samar. These three dioceses belong to the Ecclesiastical Province of Palo, Leyte, and are suffragans of this archdiocese. Vision: "A community of persons united in faith, hope and love, centered in Christ, living by the Word and the Sacramantes, prophetically witnessing to the Gospel values of sharing, unity, peace and justice, in solidarity with the poor, within the concrete historical situation and needs of the people of Samar, under the guidance of the Magisterium and the example of Mary, Mother of the Church." Goal: "By the year 2000, the Diocese of Calbayog shall have Ecclesial Communities that are renewed, transformed, animated and consumed by the Gospel values of sharing, unity, peace and justice in solidarity with the poor, imbued with the spirit of Vatican II and Plenary Council of the Philippines II, conscious and actively working toward Total Human Development, whose impact will be felt by society." Thrust: "Basic Ecclesial Communities that are committed to Evangelization and Total Human Development." The objective of the plan is to implement on a diocesan level all programs and structures identified by the Diocesan Pastoral Assembly, to evaluate the implementation of the Diocesan Pastoral Council every year, and to come up with objectives for a second phase, f rom 1996 to the year 2000. There are 27 parishes in the diocese, served by 61 priests. There are 6 Catholic institutions, 9 pastoral centers, and 18 parishes with BEC programs.